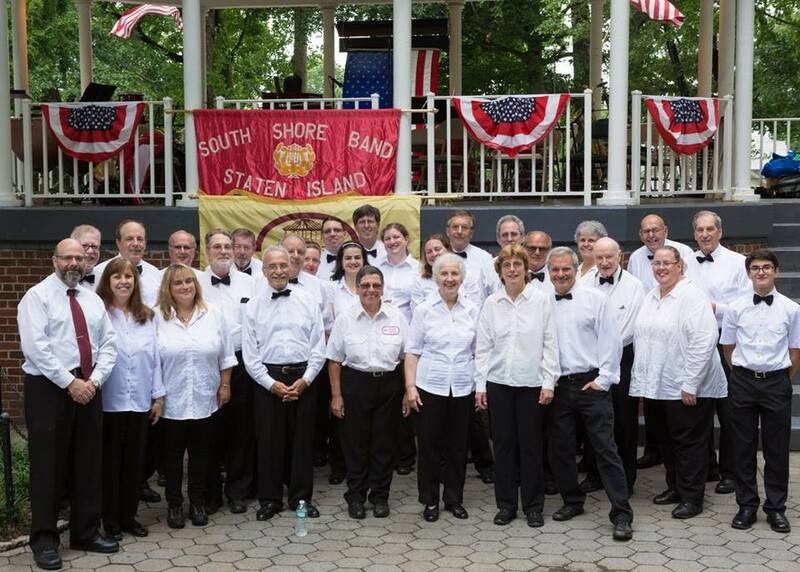 The South Shore Band is a volunteer adult community band based in Staten Island, N.Y. New members are always invited to join. Our members include professionals, amateurs, and some musicians who had long been away from active playing. All find the South Shore Band an ideal way to continue with active ensemble playing. We offer a relaxing and friendly atmosphere and now have over 40 active members. Our mission: "To provide a supportive and inspiring community band environment where musicians can share in the growth of musical expression, performance, and service to the community". The South Shore Band offers service to our local communities through concerts, performing at civic events...and other occasions where we can deepen the general public's appreciation for live performance and instill a greater pride in our community. The Band is under the direction of James De Francesco. Mr. De Francesco joined the Band in 1987, and was appointed Associate Conductor. Since 1989 Mr. De Francesco has been Conductor and Music Director for our growing community group. Rehearsals are held every Monday evening at 8 P.M. at the Gateway Church auditorium, 200 Boscombe Ave, Richmond Valley, SI, 10309. We continue to rehearse throughout the summer time as well. For more information please contact Ann-Marie Leonard, Band President at 718-356-6865, via email, or call/text my mobile number at 646-436-1918. New members interested in joining are invited to visit us at any weekly Monday evening rehearsal. Click on "Schedule of Events" within our site to learn more about upcoming appearances for the Band. Jan 15, 2019: No longer welcoming our community band, we were required by St. Paul's UMC to move out of our long time rehearsal "home". Thank you Gateway Community Outreach for welcoming us as part of your community family. We celebrate these new beginnings. In late June 2018, the Band was honored to receive citations of appreciation from the Boy Scouts of America as well as from Beauvais Hudson American Legion Post for our music support on behalf of our community. The South Shore Band is excited to welcome new and returning members to our community band family. We always have space for more new people so come on down to visit with us and learn more about our community band. Find us on Facebook for all the latest information and chatter about the band! To get a sense of the music that we are currently rehearsing you can click on “Folder Music List” to view the content of our rehearsal folders. This music list is updated regularly as music is added to our folders as we progress in various concert performance preparations (note: march book music is not included in this listing). New members are welcome in all sections. We are in particular need for added members to the following sections: Trombone, Baritone Horn, Bassoon, and Oboe. You can click on “Schedule of Events” for information regarding 2019 schedule and appearance dates as well as the 2018, 2017, 2016, 2015, 2014, 2013, 2012, 2011, 2010, 2009 & 2008 schedules. The scheduling process is always quite active with many of our events being ongoing commitments year after year. If you are interested in having the band perform please contact us early as our calendar of events that we are able to accept fills quickly. © 2004 South Shore Band. All Rights Reserved.